Cover Photo: The Sub 5 Cycling tandem team rides past Castle Rock during the Moab Gran Fondo, May 3, 2014 in Moab, Utah. Photo courtesy MoabActionShots.com. Find your event photo on their website. 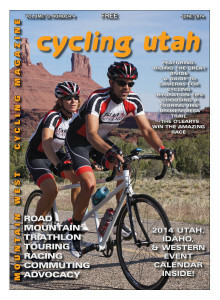 Cycling Utah Magazine's June 2014 Issue is now available as a free download (8.7 mb download), Pick up a copy at your favorite Intermountain bike shop or other location!